Very high in flavour...very high on calorie reduction too! I’ve been trying desperately to replicate a 'Potato Dauphinois gratin'...The king of gratinées! After having made these scalloped potatoes...I think I’ve come darn close to realizing my simile version of this great dish. If I may...I'll call her the 'Queen' to her King of Dauphinois. The real joy is how I’ve reduced the calories immensely without missing out on texture or taste . If you can believe it...this recipe has absolutely no cream!
. * Best potato variety for this dish are the earthy flavoured Russets or Idaho potato. They have a low moisture and are higher in starch. 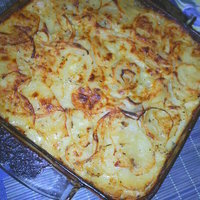 Perfect for this scalloped potatoes ‘gratin’.
. For this 3 layered dish: Generously butter a square PYREX dish: approx. size: 9.5 x 9.5 in. (24x24cm). Pre-heat the oven to 375F/190C/Gas5. Position rack in the center of the oven. Prepare a baking pan to hold the pyrex in case of spills.
. CHEESE SAUCE: Peel and crush the garlic cloves. Grate all the cheddar cheese and prepare the seasoning. Set aside. >In a small-medium saucepan melt together the butter with the olive oil on medium-high heat. Whisk in the flour to make a light 'roux' . Add a small quantity of milk at first in order to initiate a smooth blend. Then, continue whisking as to gradually add the rest of the milk. Keep whisking until the start of a thickening boil. There will be a slight rise in the saucepan...which means it's ready. Remove from the heat and add the Dijon mustard as well as the cheese, garlic and the seasonings. Set aside. Note: While preparing the onions and potatoes, make sure to give a whisk to this sauce once and a while.
. SLICING the vegetables: With the aid of a mandoline or food processor, thinly slice the onions first and place into a bowl. Repeat the same for the potatoes. Set aside.
. ASSEMBLE 3 layers: Layer a 1/3 of the sliced potatoes evenly across the bottom of the pan. Scatter 1/3 of the sliced onions. Pour 1/3 of the cheese sauce over the first layer. Repeat this process another 2 times.
. BAKE: Tightly cover finished dish with an aluminium foil. Initially bake covered for 45 minutes and then uncover for another 30-45 minutes of baking to allow the browning 'Gratin' magic to happen. Before taking out this dish, poke the potatoes in order to make sure that they are thoroughly cooked. Remove the dish from the oven and let it rest 10 minutes before serving. Great calorie-reduced recipe. Would you have any ideas of the number of calories per portion? Looking forward to trying this soon. Thanks a lot for sharing it. this was really good!! although I ended up cooking it for an extra half hour before the potatoes were cooked all the way through. Hello Liz...I was thrilled to know that you tried this wonderful dish. How thin were your potato slices?...Was your oven rack placed at the very botoom. Lastly, making sure that your oven temp. is spot on. The last point had in the past thrown me off personally for at least a few months before I realized that the oven thermometer was not giving me the right temp. After having purchased an individual oven gage...I was relieved to solve my problem. It was off by 20F. I hope one of these 3 reasons may have helped to figure out why an extra half hour was needed. Hello Mitch...thanks for your interest in this absolutlely no-fail to please potato delight. If you try it...I'd love to hear what you thought of it.